Whales are a fundamental component of our marine ecosystems whether we live near a beach or not. Sydney is a city familiar with whales sightings and their history. As whales have dominated our existence for thousands of years, take a deep look into these incredible creatures with the NEW exhibition Whales | Tohorā at the Australian Museum. Developed by Te Papa Museum in New Zealand, the travelling exhibition Whales | Tohorā explores the diversity, biology and how whales have adapted and have been treated by humans in their oceans throughout history. Visitors can expect to learn a great deal about these beautiful creatures and learn about dolphins too in this comprehensive exhibition. 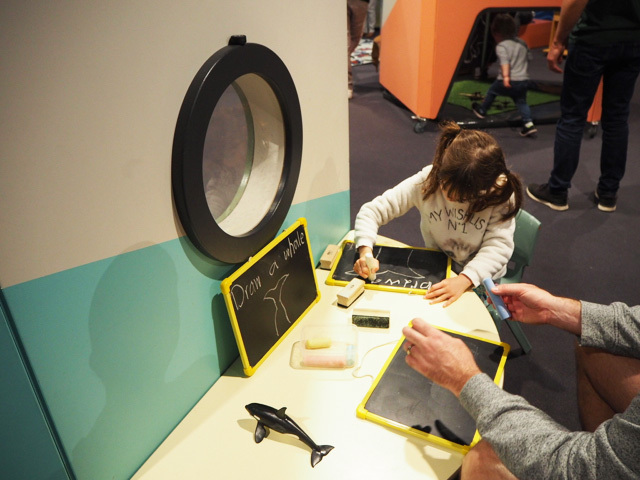 Whales | Tohorā has a number of interactive setups throughout the exhibition to show visitors and children important facts, images and videos about whales and dolphins around the world as well as interactive games and a fun children’s trail. Little Miss liked the whale and dolphin quiz about their anatomy (see pic below). Children will be impressed with the life size replica of a blue whale’s heart and can crawl inside it and watch little videos about this creature. 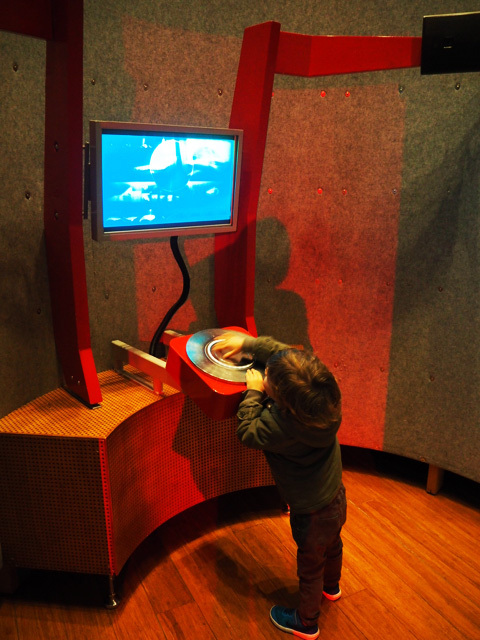 This was little Mister’s favourite part of the exhibition and very popular with other kids too. Kids will love listening the different whale sounds in the Sound Chamber. It is easy for kids to use, they can just turn the dial to listen to whale clicks as well as high and low pitch sounds some whales make. 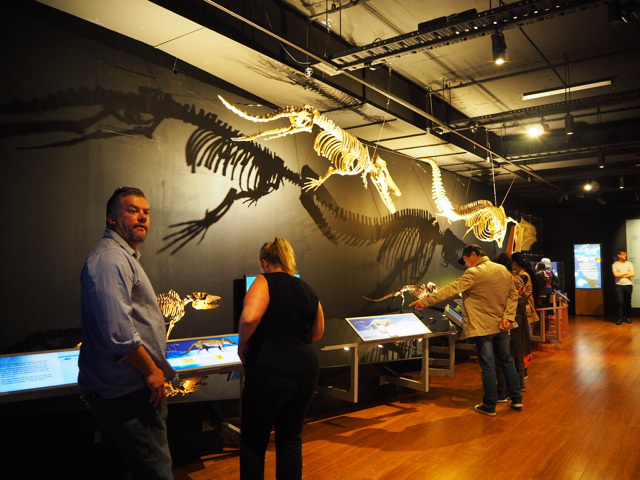 Whales | Tohorā visitors will be impressed with one of the most extensive collections of whale skeletons ever displayed including an 18m skeleton of a Bull sperm whale. 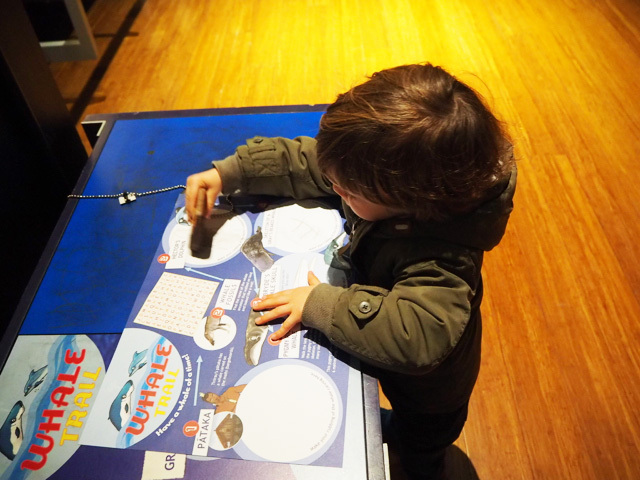 Kids will be treated to a cute Whale Trial where they can have a whale of a time looking for clues around the exhibition to help them complete the trail by using specific sections to uncover their little whale on the paper and respond to a word puzzle. Visitors will also learn how humans have revered whales, hunted them and explored their astounding adaptations to life in the sea and will learn the stories of some of the people whose lives have been inextricably linked with whales – from legendary South Pacific whale riders to whale scientists and former whaling families. 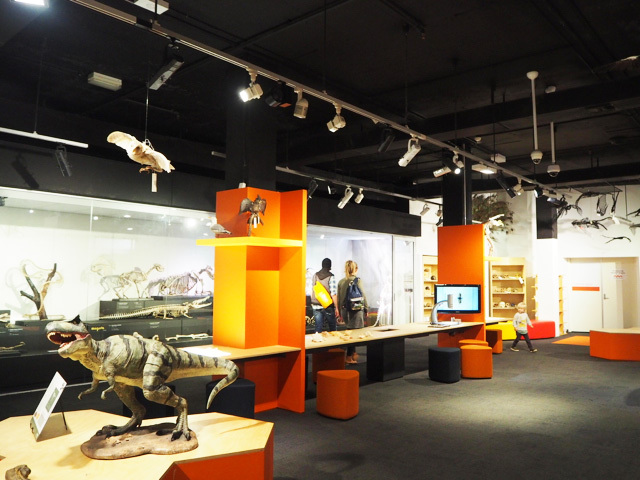 The Australian Museum also invites visitors during their visit to the exhibition to pop over near the Museum Shop and take part in the Australian Museum and World Wildlife Fund campaign by pledging to reduce their use of plastics through signing up at the Australian Museum. Whales are at the top of food chain and a fundamental component of marine ecosystems. They face constant threats from whaling, overfishing and pollution and most recently the effect that plastic pollution has had on whales and marine life across the globe has been alarming. Pledge today to reduce your use of plastics, help with beach cleanups and try to refuse, reuse and recycle when you can to help keep our oceans clean. Pop over to the revamped Kidspace after the exhibition if you have little ones under 5. It has had a great facelift and is currently themed with the Whales exhibition in mind with ocean themed water play, a game where kids are invited to match photos of whales and dolphins to their name, kids are invited to draw a whale on little chalkboards and read books about whales. And of course, kids can enjoy the three pods as well as other spots in the kidspace. 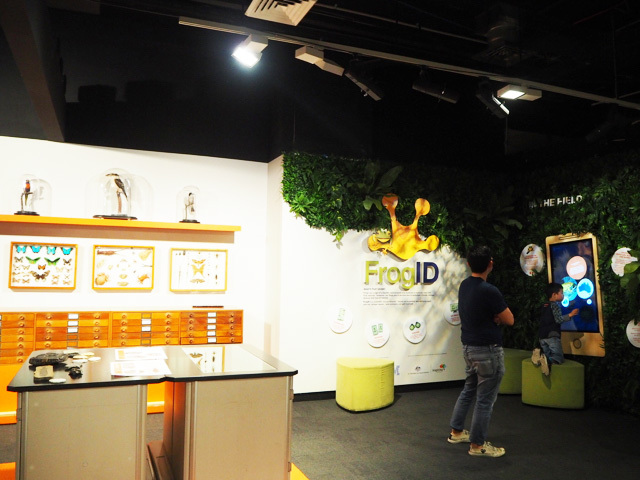 Once you’re done in the KidSpace, head to Search & Discover which also received a facelift and is looking fabulous with so much to search and discover including the new Frog ID section where kids can identify and listen to the sounds of frogs. The Frog ID is a great app which helps you identify and learn about frogs near you all while contributing to science with your help. There is a small section for little ones to relax and read, spots where they can look at insects through microscopes, a dinosaur area where they can colour in and make their dinosaur on the screen and more. General Admission to the Museum applies. Adult $15, Concession $8, Kids 0-15 years Free, Family (2 adults 2 Kids) $30, Family (1 adult 2 Kids) $15. AM Members go Free. Admission to Whales | Tohora is additional Adult $27, Concession $22, Kids 5-15 years $14, Kids 0-5 yrs Free, Family (2 adults with up to 3 kids) $72, Family (1 adult with up to 3 kids) $49. Members can discounted rates for the exhibition. 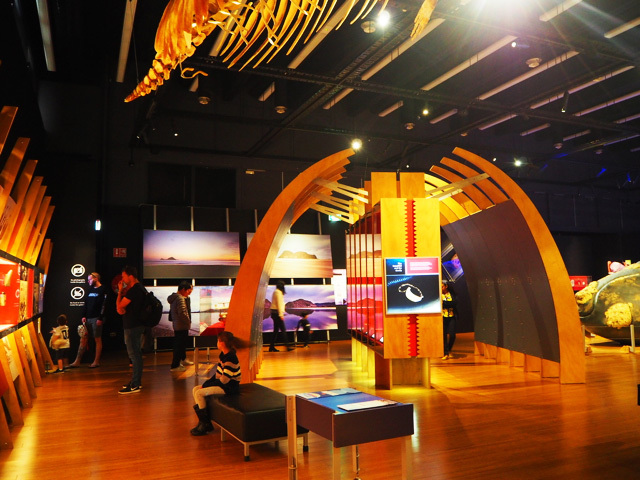 New Members who join up during the exhibition, get free entry to Whales | Tohora. Whales | Tohora is on now until Sunday 28th April 2019. There are changing facilities on level G on the Museum as well as in the Search & Discover area and KidSpace area. The Australian Museum is pram and wheelchair friendly with a number of ramps as well as lifts. For more information on the Australian Museum, head to their website. Busy City Kids were invited to the Australian Museum for the purposes of a review. All opinions & feedback are genuine & truthful. Food and travel were self funded.